An option is a financial instrument that gives its holder the right to buy or sell an underlying asset at a pre-agreed price at specific moments in time (Hull 2011). The first feature of an option contract is that it gives the holder the right to do something, but not the obligation (Bachelier 1900). If an option entitles to buy an asset, the option is referred to as a call option, while a put option is the right to sell an asset (Brennan and Schwartz 1977). The pre-agreed price at which the holder can buy or sell the asset is the strike price or the exercise price. The time to maturity is the time period which indicates when the holder can exercise the option. When an option is exercised during the entire period, it is commonly referred to as an American option, while a European option contract can be exercised only at the predetermined expiration date (Cassimon et al. 2007). While the holder determines whether he or she is going to execute or exercise the option, the counterparty (the writer of the option contract) needs to deliver the asset to the holder at the pre-agreed price (in case of a call option) or buy the asset from the holder at the pre-agreed price (in case of a put option). The writer’s action is thus dependent on the decision of the holder. For that flexibility, the holder of the option pays an upfront, non-refundable fee to the writer, which is called the premium, reflecting the market price of that option (Cassimon and Engelen 2016; Black and Scholes 1973; Cox et al. 1979; Merton 1973). One can find option contracts on a wide range of assets, including options on common stock (e.g., on a share of Google), options on a stock index (e.g., on the S&P-500, or the Euronext-100 index), options on currencies (e.g., on the EUR/USD exchange rate), options on commodities (e.g., on corn, cattle, soybeans), options on bonds, options on the weather conditions, etc. Options on common stock can also be part of the salary package of senior firm staff. Besides those financial options on a wide range of assets, the concept of options has also been applied in a business context (Cassimon and Engelen 2015; Cassimon et al. 2004). Options are available on standardized option exchanges or tailor-made from financial institutions in the over-the-counter market. The most important option exchanges include the Chicago Board Options Exchange (CBOE), the CME Group (a merger between the Chicago Mercantile Exchange and the Chicago Board of Trade), the Philadelphia Stock Exchange (now part of NASDAQ), Eurex, NYSE Derivatives (Intercontinental Exchange), the National Stock Exchange of India (NSE), the Bombay Stock Exchange (BSE), and Bovespa. The most traded index options in 2016 included contracts on the Nifty (India), KOSPI 200 (Korea), BankNifty (India), EuroStoxx50 (Eurex), and the S&P500 (CBOE), while most stock options were traded at Bovespa (Brazil), NASDAQ, and NYSE (top three with 47% of the market in 2016). The most actively traded currency option contract in 2016 was on the USD/INR exchange rate. Standardization is an important feature of option contracts on exchanges to secure liquidity. This implies that option contracts are only available for specific amounts of the underlying asset, for specific strike prices, for specific maturities, and for specific exercise rights (American versus European). For instance, the CBOE uses the following standardized features for its option contracts on stocks: the underlying value amounts to 100 shares; the strike price intervals are typically set 2.5 points when the strike price is between 5 and 25 USD, 5 points when the strike price is between 25 and 200 USD, and 10 points when the strike price is over 200 USD; and the expiration date is the third Friday of the expiration month, with contracts available for two near-term months plus two additional months from the January, February, or March quarterly cycles. Finally, the stock options are American option contracts. Table 1 gives an example of option price series for different strike prices and time to maturity of 3 months for an underlying stock with a current price of 22.57 USD. In the following we show that options can be used both for (speculative) investment transactions and to provide hedging. 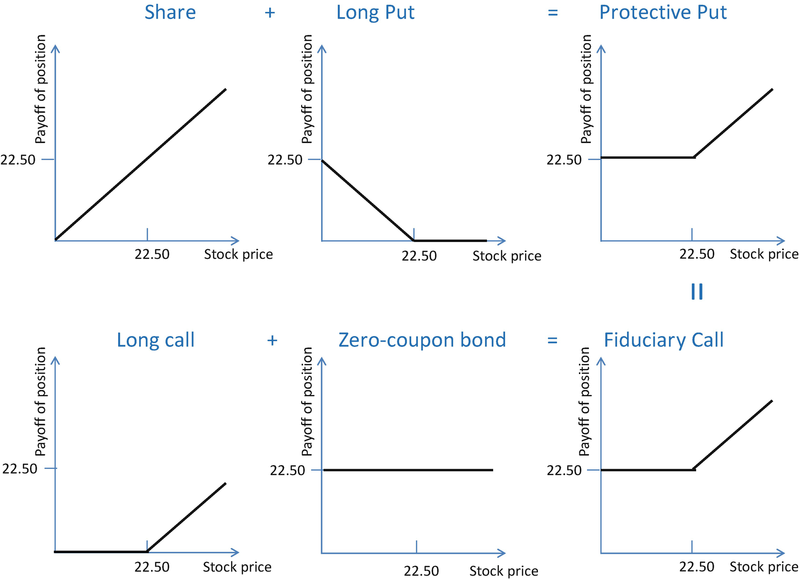 Options are used as an investment when its holder does not hold the underlying asset and is using the investment in the option to (deliberately) create an open position in which he/she is exposed to risk, i.e., to the price evolutions of the underlying asset, hoping that the price evolves in his/her advantage, leading to a gain; however, prices can also move disfavorably, leading to a realized loss. In this sense, these investments are “speculative.” When, on the contrary, one holds the underlying asset (or will acquire it somewhere in the future, during the lifetime, or at expiration of the option), an option can be used to allow the holder to protect (to hedge) the value of the underlying asset against future adverse price evolutions. In section “Basic Payoff Profiles of Options from an Investment Perspective,” we discuss the basic alternative uses of an option as a speculative investment instrument, showing the different payoff (i.e., the gain/loss) schedules; we also show (in section “Options as a Leveraged Investment”) that such option investments are highly leveraged, i.e., enabling high potential returns (but also high losses) at low investment costs (compared to investment in the underlying asset itself). Section “Using Options for Hedging” then discusses the use of an option from a hedging perspective. 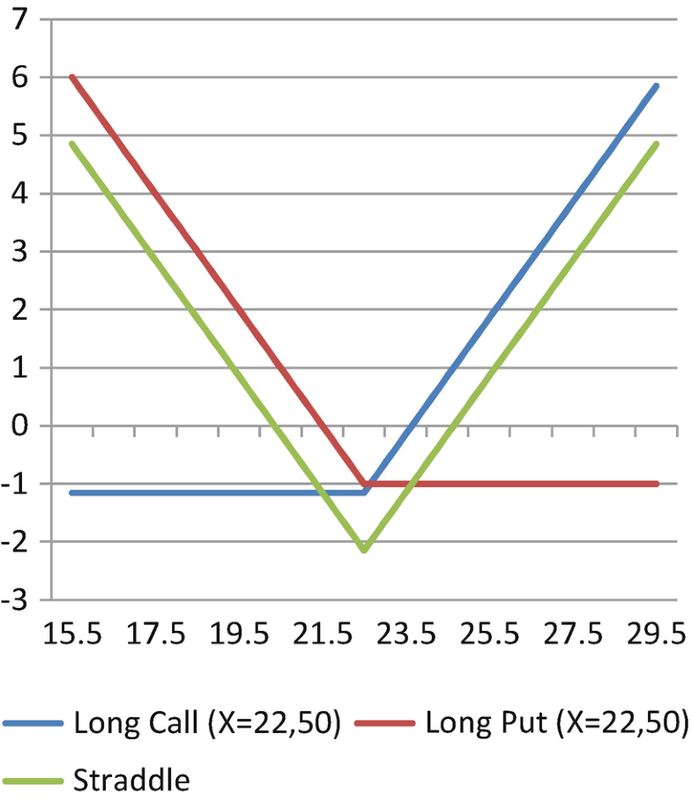 In section “Option Combinations and the Put-Call Parity Relationship,” we discuss some more sophisticated option combinations and also point to the theoretical so-called put-call parity relationship. Finally, “Conclusion” section discusses some societal consequences of the introduction and use of options. We will use the example of a stock option and the data of Table 1 throughout the remainder of this contribution. This section gives an overview of the basic payoff profiles of holding or writing call and put option contracts until expiration date. As such, we assume that the parties do not hold the underlying asset, here the underlying stock, and create a particular position, based on their subjective ideas (or superior information) on the future stock price evolution, hoping to make a profit but at the same time exposing themselves to potential losses in case their subjective ideas or information proves wrong and prices move adversely. We will illustrate the basic payoff profiles using the stock option contract with a strike price of 22.50 USD from Table 1. We provide payoff profiles for the holder of the call option (also referred to as a long call) and the writer of the call option (also referred to as a short call). In a similar vein, we provide payoff profiles for a long put (holder) and a short put (writer). The holder of a call option has the right to buy one share of the underlying at the strike price of 22.50 USD. Depending on the stock price at expiration, he will exercise his option or let it expire. For instance, when the stock price at expiration is equal to 20 USD, the holder will let the option expire because one needs to pay 22.50 USD upon exercising the option (right to buy at 22.50 USD), while one can buy the underlying stock directly at the market at a price of 20 USD. In contrast, when the stock price at expiration amounts to 25 USD, the holder will exercise the option and buy the underlying stock from the writer of the contract at a price of 22.50 USD, while its market price is equal to 25 USD. In this way, the holder realizes a profit of 25 USD minus 22.50 USD or 2.50 USD, ignoring any premium paid to acquire the call option. The example shows that as long as the stock price at expiration is smaller than the strike price or exercise price, the option is worthless and will not be exercised. Put differently, it will take a floor value of zero. 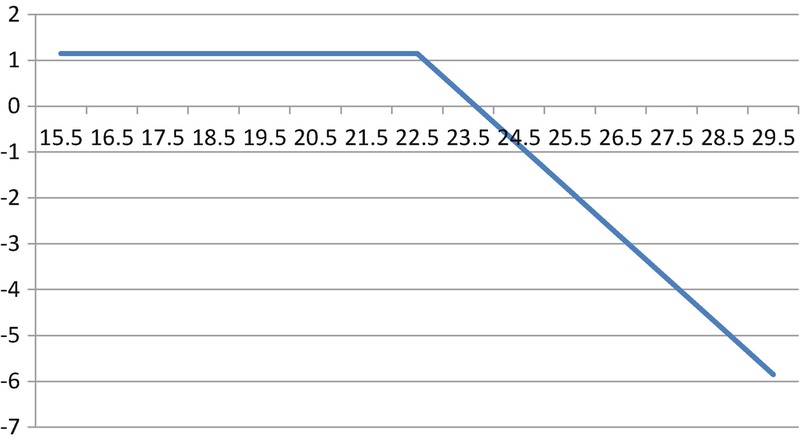 When the stock price is lower than the exercise price, the call option is said to be out-of-the-money. As soon as the stock price at expiration is higher than the strike price, the holder will exercise its right and buy the underlying stock at the strike price. The holder will realize a profit, being the difference between the underlying stock price and the strike price. In this case the call option is said to be in-the-money. When the stock price equals the strike price, the call option is said to be at-the-money. This is reflected in Fig. 1 in the asymmetric payoff profile of the call option. Zero profit for stock prices up to the strike price, a positive profit for stock price beyond the strike price. This is the most powerful characteristic of an option. The holder can cut off losses but keep the upside potential open. This powerful mechanism of being able to limit downside losses does not come for free. In order to acquire the option, the holder typically has to pay a premium. In our example, the premium of the call option is equal to 1.15 USD (see Table 1). This implies that as long as the call option at expiration ends up out-of-the-money (the stock price is smaller than the strike price), the holder will not exercise and loses the premium of 1.15 USD. As soon as the option ends up in-the-money (stock price higher than the strike price), the holder will exercise and earns the difference between the stock price minus the sum of the exercise price and the premium (see Fig. 2). 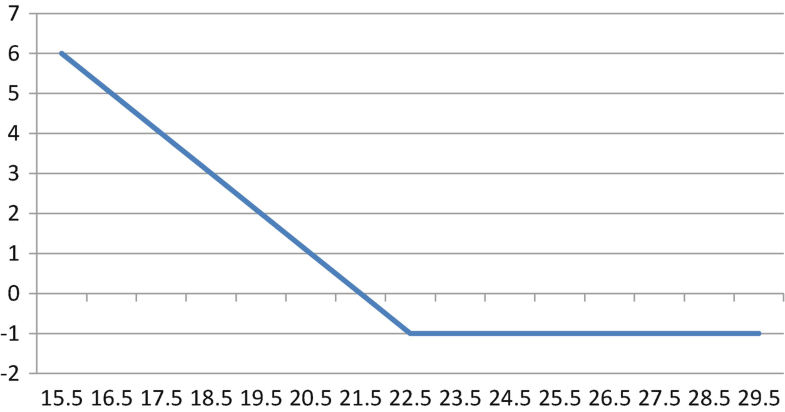 The payoff profile of a short call contract reflects the position of the writer of the call option contract. The short call is the mirror image of the long call and follows the decisions of the holder of the call option contract. As long as the stock price at expiration is lower than the strike price, the holder of the call option will not exercise the option contract and let it expire. This implies that the writer of the option does not have to do anything and can just keep the premium for giving the holder the right to buy the share at the pre-agreed strike price. For instance, in the above example, at a stock price of 20 USD, the call option expires, and the writer collects the premium of 1.15 USD. As soon as the stock price at expiration is higher than the strike price, the holder of the option will exercise his or her right to buy the underlying share at the pre-agreed strike price from the writer of the contract. For instance, in the example, at a stock price of 25 USD, the holder will exercise the option and will turn to the writer of the contract to buy the underlying share at the strike price of 22.50 USD, while the market price amounts to 25 USD. The writer is obligated to deliver the share to the holder in return for a cash amount of 22.50 USD. The writer thus incurs a loss of 22.50 USD – 25 USD or − 2.50 USD. As the writer also received the premium of 1.15 USD, the net loss is 2.50 USD minus 1.15 USD or 1.35 USD. Figure 3 shows the asymmetric payoff profile of the writer of the call option contract. As long as the stock price at expiration is smaller than the strike price, the maximum profit for the writer is the premium; as soon as the stock price at expiration is higher than the strike price, the writer incurs losses. Note, however, that there is no limit to these losses: the higher the realized stock price, the higher the loss; as such, unprotected engagement in the writing of options is a very dangerous strategy. 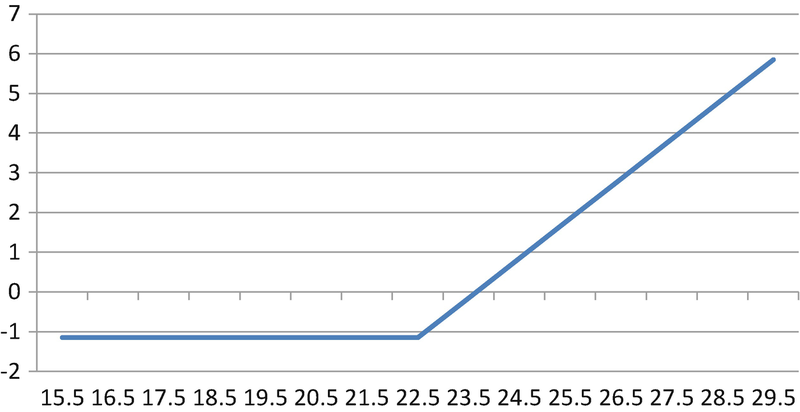 Note also that when one compares the payoff profiles of the holder (Fig. 2) and the writer (Fig. 3) of the call option, it is clear that their payoffs are mirror images of each other. The holder of a put option has the right to sell one share of the underlying stock at the strike price of 22.50 USD. Depending on the stock price at expiration, he will exercise his option or let it expire. For instance, when the stock price at expiration is equal to 25 USD, the holder of the put option will let the option expire because one receives 22.50 USD upon exercising the option (right to sell at 22.50 USD), while one can sell the underlying stock directly at the market at a price of 25 USD. The put option is said to be out-of-the-money. In contrast, when the stock price at expiration amounts to 20 USD, the holder will exercise the put option and sell the underlying stock to the writer of the contract at a price of 22.50 USD, while its market price is equal to 20 USD. The put option is in-the-money. In this way, the holder realizes a profit of 22.50 USD minus 20 USD or 2.50 USD, ignoring any premium paid to acquire the option. If one also takes into account the premium of 1.00 USD (see Table 1), the net profit amounts to 1.50 USD. 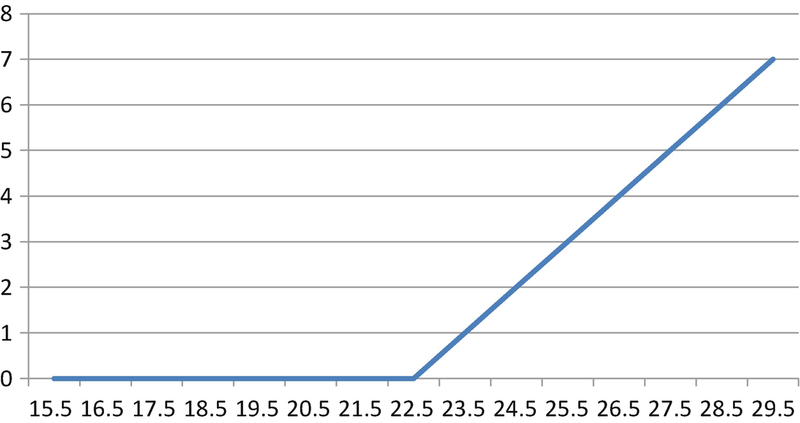 Figure 4 shows the asymmetric payoff profile of a long put option. As long as the stock price at expiration is higher than the strike price, the put option is out-of-the-money and will not be exercised; hence, the holder just loses the premium. As soon as the stock price at expiration drops below the strike price, the put option ends in-the-money and will be exercised, leading to a positive profit, again largely unlimited (constrained only by the asset becoming completely worthless, in which case the profit here is 21.50 USD). Figure 5 shows the payoff profile of a short put or the position of the writer of a put option contract. The short put is the mirror image of the long put and follows the decisions of the holder of the put option contract. As long as the stock price at expiration is higher than the strike price, the holder of the put option will not exercise the option contract and let it expire. This implies that the writer of the option does not have to do anything and can just keep the premium for giving the holder the right to sell the share at the pre-agreed strike price. As soon as the stock price at expiration is lower than the strike price, the holder of the put option will exercise his or her right to sell the underlying share at the pre-agreed strike price from the writer of the contract. The writer will incur losses in this instance, which become higher at lower prices, and again constrained only by the asset becoming completely worthless, in which case the loss here is 21.50 USD. It reiterates the considerable riskiness involved in option writing. It is important to understand that options allow for highly leveraged investments. The cost of investing in an option is much lower than that of investing in the underlying asset: investing in say buying a long call (at 22.50 USD) costs the holder 1.15 USD (the premium), while buying the stock itself requires an investment of 22.57 USD. The evolution of the payoff of both will depend on the stock price evolution, but the payoff of an option is much more sensitive to these price changes than that of the investment in the stock: assume that, at expiration, the realized stock price equals 25 USD. Then the rate of return of investment in buying the stock is about 10.8% (the difference between current and buy stock price, which is 2.43 USD, divided by the investment cost of 22.57 USD), while the rate of return on the option equals 117% (the payoff at 25 USD from Fig. 2, which is 2.50 USD, divided by the investment cost of 1.15 USD). Of course, at adverse price changes, the negative rate of return incurred on a stock investment is lower than that on the option, which is often equal, but limited, at losing the full investment cost (when the option expires unexecuted). When one holds the underlying asset, an option can be used to allow the holder to protect (to “hedge”) the value of the underlying asset against future adverse price evolutions. In fact, this was the prime reason why options were designed. More particularly, the holder can buy a long put, which is identical to the example of Fig. 4. The final result is given by Fig. 6: it is a combination of the stock price curve, which shows the result of stock price changes when being unprotected, with the long put payoff curve. The combination of the two curves provides for the final “protective put” result. It shows that when the stock price declines, this is largely compensated by the gains that the holder makes in that case on the long put position, while, as the stock price increases, the option expires unexecuted (with a loss equal to the premium). 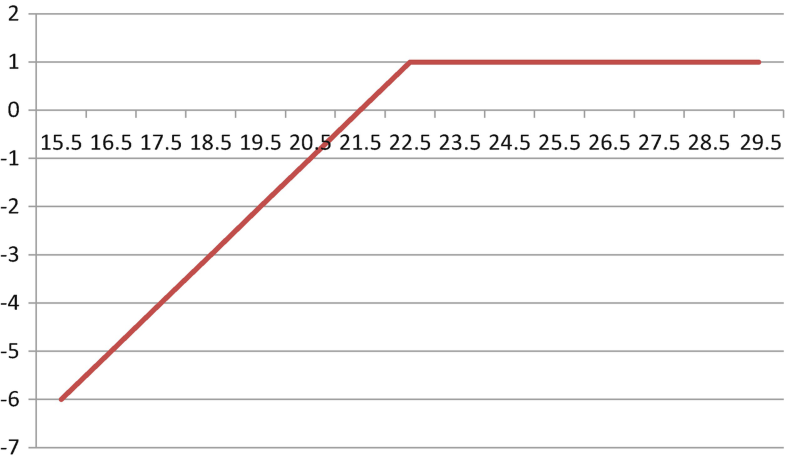 As a result, the use of this long put allows the holder of a stock to lock in a minimal (“floor”) value of the stock of 21.50 USD (which is the exercise price minus the premium of 1 USD), irrespective of what happens to the stock price, while still being able to enjoy the upward potential in case the stock price increases. 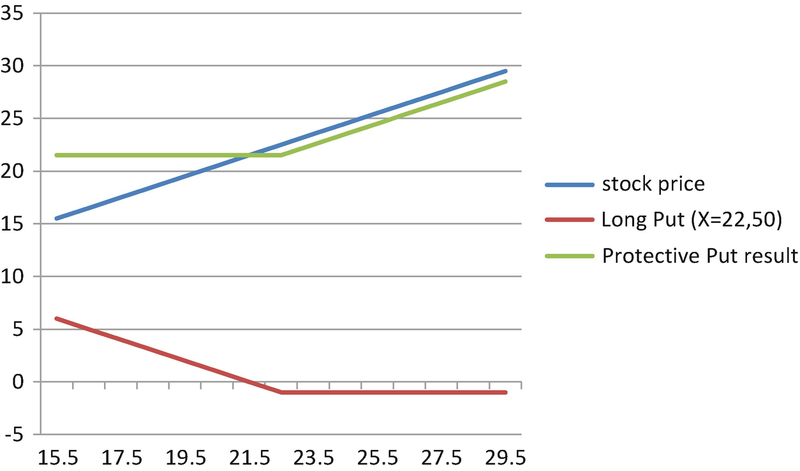 It is clear from comparing the (unprotected) stock price and the protective put curves that hedging does not always lead to the best result (the highest stock value); in case of stock prices higher than 21.50 USD, the unhedged position is better than the hedged one (due to the premium paid to buy the long put option), but hedging does avoid large losses in case of a large stock price decline. The protective put is basically an insurance against a crash of the value of the stock (or a portfolio of stocks). The availability of options with different strike prices will allow for fine-tuning of this position, where locking in a somewhat higher minimal value (by using long put options with a higher strike price) will come at the expense of a lower remaining upward potential. Similarly, when one will acquire the underlying asset somewhere in the future, during the lifetime, or at expiration of the option, an identical strategy of buying a long put can protect against the risk of a drop in the price of that asset in the meantime, leading to the same result as in Fig. 6. If prices turn out lower than the strike price, the holder will exercise the option and sell the share that he/she acquired now at that strike price; as such, a minimal income of 21.50 USD will be secured. At stock prices higher than the strike price, the holder will sell the acquired share in the market at that higher price, and the net income will be that higher price minus the option premium paid. Besides the standard payoff profiles of the basic option positions (call/put, long/short), one can create any tailor-made payoff profile by combining several call and put options together, which will accommodate best the particular subjective ideas or information on future price developments, in case of the use of options as an investment vehicle, or the particular desired hedging outcome otherwise. For instance, one could combine a long call and a long put position with the same strike price in one investment portfolio. The combined payoff of holding both option positions simultaneously is referred to as a long straddle position (see Fig. 7). This long straddle will pay off to the holder as long as the stock price at expiration is lower than 20.50 USD or higher than 24.50 USD. If the option ends up at-the-money (at the strike price of 22.50 USD), the holder incurs a maximum loss of 2.15 USD, being the sum of the premium paid for the call option (1.15 USD) and the premium paid for the put option (1.00 USD). This is a valuable trading strategy if one expects the stock price to break out, but one is uncertain in which direction. For instance, one expects a pharmaceutical firm to announce news on its R&D program: if the news turns out to be good, one expects the stock price to increase; if the news is unfavorable, one expects the stock price to decline. A straddle position could be a valuable trading strategy in such a situation. In contrast, if one expects the stock price not to move, one could create a short straddle by simultaneously writing a call and put option with the same strike price. If the future materializes as expected, the writer will capture both premia; if the price moves too much in either direction, the writer will incur (unlimited) losses. An alternative strategy to a long straddle is to combine the long call option and the long put option with different strike prices. For instance, one can combine a long put with a strike price of 20 USD with a long call with a strike price of 25 USD. Such a combination is referred to as a long strangle. 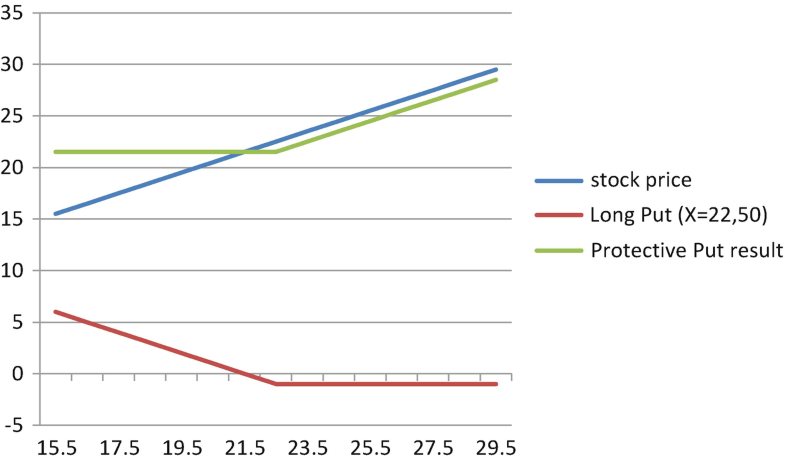 In comparison to the long straddle, the maximum loss is smaller (0.60 USD versus 2.15 USD), but the underlying stock price has to move more before the holder will profit (20/26 USD versus 20.50/24.50 USD). By setting the strike prices of the call and put options closer or further away from each other, the holder of the strangle can trade-off reducing the maximum loss with a larger break-even point (Fig. 8). Finally, Fig. 9 shows a combination of option contracts with other financial assets, which will also lead to the derivation of the so-called put-call parity. The upper panel again shows the combination of a share with a long put contract, which is the same as the protective put situation of section “Using Options for Hedging” (and Fig. 6), without including the premium. The lower panel shows a fiduciary call position. It involves entering into a long call position and simultaneously investing the present value of the strike price on a risk-free interest account. 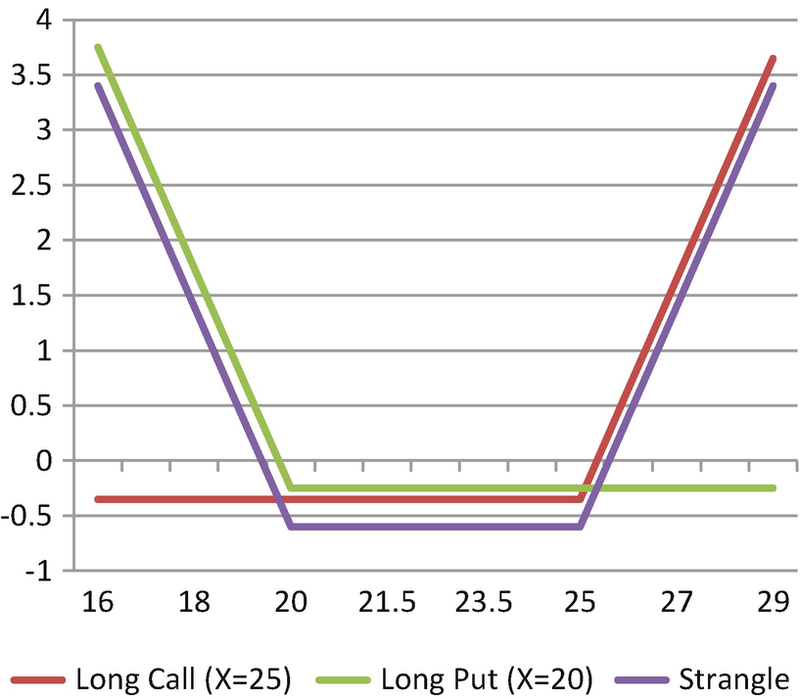 One can observe that the payoff profile of the protective put and the fiduciary call is exactly the same: the value of a share plus a long put equals the payoff of a long call with the present value of the strike price. Or, put differently, the value of a long put equals the value of a long call plus the present value of the strike price minus the value of the underlying share. This relationship is referred to as the put-call parity and expresses the relationship between the value of a call option and an otherwise identical put option. This implies that once one knows the value of a call option, one can easily calculate the value of a corresponding put option. The put-call parity is a powerful relationship as an arbitrage constraint on option prices and as a tool to transfer risk between options (Haug and Taleb 2011). The explanation of their dual use in this contribution has shown that the creation of the option instrument and option markets has brought about real benefits to its users and financial markets at large, first of all through the ability of individual investors, financial and nonfinancial firms, as well as governments to hedge themselves against all kind of underlying financial risks, which provide more financial stability and insurance against catastrophic outcomes, and, secondly, through the creation of additional financial, highly leveraged investment opportunities, which combine flexibility with low investment input and high potential returns. At the same time, as also shown in this contribution, these benefits come at the expense of potential high costs to the same aforementioned types of users, and even at the world systemic level, due to the potential negative externalities caused when options are used in highly speculative investment strategies that go wrong, in the sense that they result in huge, sometimes unlimited, losses, leading to severe financial distress not only in these entities, but which can then potentially also be transmitted throughout interlinked financial markets, firms, countries, and the financial system at large. Well-known examples include the presence of “rogue traders” such as in the case of Barings Bank or the use of options in speculative currency attacks against countries (see, e.g., Jacque 2015). Preventing such potential catastrophes requires the use of appropriate and rigorous checks and balances at the level of individual firms or governments, self-regulation at the level of financial markets, and other regulatory interventions at the global level (Van Liedekerke and Cassimon 2000).